You can find this wine in the “cheap” section of your local wine store, right near the big bottles of Barefoot and Cavit. The scent was a bit subdued until it was open for a while – then I got a pretty complex nose of raspberries, blackberries, currant, pepper and a little cedar. Jammy midpalate, very juicy finish and lingerii88iuuuu;;;;;looo8888887;lkvjklhjkl;’nm,.km,,k5r – yeah, that was me cleaning my keyboard. As I was typing this blog, my dad knocked over my wine glass, it shattered and a few drops got on my keyboard – ah, clean now! Fruit, pepper and a bit of oak still lingering on the finish. 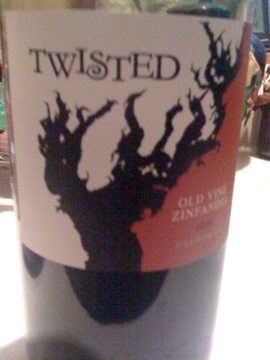 Very, very well made zin – especially at its price point. Another great wine to buy to serve to guests at a party, or bring to a party!